A clean scent, yet surprisingly magnetic. A modern yet traditional Eau de Cologne that lasts forever. Dominique Ropion embraces musk’s nature as both a quasi-aphrodisiac and a scent of purity to create a very personal interpretation of Eau de Cologne. A splash of the best neroli intertwined with orange blossom, bergamote, and the most technical musks for a scent that endures, and endures, and endures... Cologne Indélébile (Permanent Cologne). A clean scent, yet surprisingly magnetic. A modern yet traditional Eau de Cologne that lasts forever. Dominique Ropion embraces musk’s nature as both a quasi-aphrodisiac and a scent of purity to create a very personal interpretation of Eau de Cologne. A splash of the best neroli intertwined with orange blossom, bergamote, and the most technical musks for a scent that endures, and endures, and endures...Cologne Indélébile (Permanent Cologne). An immaculate concept(ion): Cologne Indélébile. The clean union of traditional Eau de Cologne with a laundromat. Frédéric Malle embraces contemporary musk’s nature as both a detergent and dryer-sheet fragrance in this calculated-to-sell "modern" interpretation of Eau de Cologne. A splash of neroli and orange blossom can't besmirch scrubbed-clean, "Home Economics" white musk: Cologne Indélébile (Permanent Press Cologne). From the first spray of Cologne Indélébile, clean white musk intrudes2 and never disappears, mixing first with a creamy squirt of lemon in the opening, and then with standard-issue neroli and orange blossom in mid-development, and finally gathering force to augment a sweet accord I'll describe as "white grape juice." The base of Cologne Indélébile presents a type of orange blossom I hate: steamed orange blossom (add a drop of orange blossom water in your iron's steam compartment and iron something...the orange blossom will smell starched, washed-out — and a bit metallic thanks to the heat of your iron's metal bits). I don't find Cologne Indélébile unusually long lasting; I power-sprayed myself with it on an 80-degree day and it lasted about five hours before becoming a skin scent (and that was too long for me; at the two-hour mark I wanted its drone to cease). My local Barneys New York sales assistant said there was a waiting list here in Seattle for bottles of Cologne Indélébile, even before her 'clients' had smelled it, and I believe her. This is a simple, citrus-y, fresh-as-can-be, orange blossom-and-white musk concoction, just what the washed masses (apparently) crave. If you love CLEAN fragrances and !White Musk! (and price is not an issue), try Cologne Indélébile. 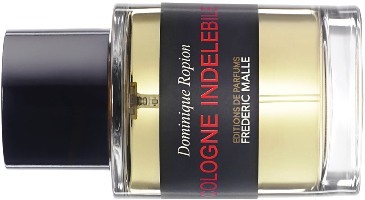 As for me, Cologne Indélébile is the least interesting Frédéric Malle perfume, and a dull Eau de Cologne. Quick poll: name your favorite, must-sniff Eau de Cologne — traditional or non-traditional. Frédéric Malle Cologne Indélébile is available in 100 ml ($260), 50 ml ($180), three 10 ml travel sprays ($125) or a single 10 ml travel spray ($50). For buying information, see the listing for Frédéric Malle under perfume houses. 1. Listed ingredients: bergamot, lemon, narcissus, orange blossom, neroli, musks. 2. I dislike white musk when used in quantity; if you enjoy it, the Cologne Indélébile experience may be quite different. My favorite cologne is Chanel with Tom Ford’s pre-reformulated Neroli Portofino coming in second. I was gifted both of them. I would never pay that much for cologne, but I love them in 90 plus degree heat with 85% humidity. Tejas…Neroli Portofino reformulated already?! Both are good choices. Yes. Sometime between 2013 and 2014. I sprayed it at Sephora and got a terrible migraine whereas my bottle from 2012 doesn’t give me a migraine. Thenonblonde confirmed the reformulation. Tejas: I can’t trust perfume at my two Sephoras…they basically BAKE it on the shelves…warm to the touch the lights are so intense! And that would probably explain why Neroli Portofino did not impress me terribly after I had a sample made at Sephora not that long ago ….I remember when it first came out there were quite a few positive reviews….and I kept thinking as I wore it this weekend, what am I missing? To me it smelled like 4711 (which I happen to like) with just slightly longer longevity…and for the price tag I was actually expecting to be WOWed. chocomarrzipan: even when it was first released I felt the price was way off…it was nice, but not that nice! It’s still very popular. tee hee at home economics musk–alas, we know it’s here to stay for the forseeable future if Malle’s doing it. I like vintage Eau Sauvage, and for modern Sycomore and one of the Guerlain eaus (can’t remember which). Ooh – nice – vetiver colognes are fast becoming my fav. AnnS: Yes..Kenzo Air for a cologne-ish vetiver. galbanumgal: so many great Guerlain cologne classics…may they all remain white musk free! Agree with the Olivia comment Kevin. I am not an Eau de Cologne person.. the Chanel is nice but overpriced, imo. I think if I was somehow feeling extra citrus-y…I’d pick an Annick Goutal-maybe. Citrus and white musk is def not my thing. Malle really isn’t my thing much either. So, this one is a pass! I liked one or two of Malle’s. One didn’t last on my skin at all. There are also some Dior Escale scents that aren’t bad and better priced than the Tom Ford, Malle, etc. Omega: true…I still like Eau d’Hadrien. Hey Kevin, I appreciated your “rewrite” version of this, along with the “PC” version. -; I tried this a few weeks ago, and loved it at first sniff. I love orange blossom, so that was pretty much a gimme. After the first sniff, I didn’t love it so much, and am of the same opinion as you. I have a sinking feeling about the new ownership of the company. My must-try eau de cologne, and hot weather staple, is R&G Jean Marie Farina. I have a vintage bottle, but I would bet that the newer versions would be equally wearable. AnnE…it’s CHILLY here in Seattle today…the heat came on! Raining, too. I’ve always enjoyed Jean Marie Farina…bought my first bottle in Mexico City when I was about 23. Lol! Great review, as usual, Kevin. This sounds pretty boring. And that’s coming from someone who likes light, clean florals for the most part. But I kind of expect more from FM. Resting on the laurels, perhaps? anna: this one does not “read” F Malle to me, either…but brands change as we know. A pity as Ropion has done such great work with Malle. My favourite cologne? Eau de Guerlain, without a doubt. It’s a genre that I’m extremely fond of and that is very well represented in my wardrobe but this one is still my favourite. I was thinking based on some of the most beautiful complex Ropion fragrances from the past (some that I love!) he must have been sleep walking through this one. AnnS: I don’t think we can blame Ropion…FM picks what’s bottled in the end; I assume C. I. is what they were aiming for. To be sure. I don’t blame him, but it’s sad to have all that talent being underused. My first buy of this year was Une Fleur de Cassie, my favourite Malle, and one of my most treasured bottles. I wear it a lot, and I have a lot of bottles that I love, and love wearing. I thought the whole point of an Eau de Cologne was that it would be fleeting- a light refreshing spray that lasts for a short while and then vanishes. While most people value a scent’s staying power, an evanescent summer scent has its uses. If going to a “scent free” environment, it will be gone before one has arrived. If one instead wants to again be refreshed, one can spray again. I keep a bottle of Guerlain Imperial in the fridge during the super hot spells of summer, knowing that I can use it to cool myself several times in afternoon. Others use Jean Nate after an afternoon or evening shower in the knowledge that it will not “indelibly” cling and choke as one turns into sleep. I avoid “white musk” as much as I can, but doesn’t everyone else love the “hiver” white musk scent by Malle? (I forgot its full name). L’Eau d’Hiver is much more than white musk though. austenfan: with me…the amount of white musk seals the deal…it’s listed in many scents I like, but I don’t smell it as “white musk”…such as in Jardins d’Ecrivains George where I don’t “feel” it at all, but it’s a listed ingredient. Now that is an other beauty. I’ve only got a small sample, but wouldn’t mind a bottle. Dilana: Eau de Cologne Impériale is my all-time favorite…it would even pay if I bought one of those two-foot tall bottles! HA! Eau de Rochas is also great…vintage English Leather for a cheap-thrill. I need to try some Jean Nate…don’t think I’ve ever smelled it! When I tried this I felt that the creative direction must have come from Frederic Malle’s accountants who were after a sure fire populist hit. I was expecting a twist or some extra dimension but for the life of me I couldn’t see what there was in the perfume that accounted for its aspirational Malle pricing – there are better colognes out there at a quarter of the price. Like you I didn’t find it ‘indelible’, it was most gone after 4 hours and I went crazy spraying it . I’m happy with my guerlain cologne and my Tom Ford Neroli Portofino which do the job well enough for me not to ever need to sniff this again. nathan: the pricing just blows my mind on this one: a 10 ml vial for $50!!! Like you, I found nothing special in this one (but other reviewers have loved it). Your rewrites are great. Apparently this one fell flat on its face, which you even depicted in your toppled over bottle image. Im guessing Demeter has this fragrance already for a tenth of the price. Rictor: HA! And I’m sure many brands sell something very close to this at a fraction of the price. My fav’ EdC? Definitely Imperiale By Guerlain. The regular and the vintage Dry version (with it’s subtle, quinine-like aromatic texture). Mike: I used to be able to find bee bottles of Imperiale of an older vintage, now, not so much…but I almost always have some in the house. My favorite colognes are 4711 and L’eau de L’artisan, though I wouldn’t consider either to be “must sniff.” They’re just something I like for an easy day. Thank you for the fantastic review. It made my day. Lucy: you’re welcome! Both of those are good…I buy the 4711 soaps all year. Thanks for your review Kevin, which I completely agree with! Does the beautiful Eau de Magnolia qualify as (floral) cologne? If it does, it is a superb option to classic cologne. Still, I’m a big fan of Acqua di Parma, Villoresi Colonia and the wonderful Chanel cologne. Talking about sort of vetiver cologne you mentioned, how do you rate Vetiver Babylone Armani Prive’? Lupo: the Armani is A FUN vetiver … I really like it (or did when it was released…hope it’s not been tampered with). Ah…one I’ve not tried: the Villoresi Acqua di Colonia (it sure SOUNDS nice from the description). 1) Florida Water. I grew up with this stuff . Talk about clean and fresh! 2) Cologne 4711- Again, I grew up with this stuff, and both genders in my home wearing it in hot, sticky Brooklyn summers. 4) Chanel’s Eau de Cologne! Ede: I loved when Florida Water came in glass bottles…now it’s in plastic! I used to put it in my wet hair in summer…no doubt it destroyed my cuticles! HA! LOL, Kevin, I love your edits! However, watch out: if there is a Home Economics Association, they should sue you for libel. Favorite colognes: thanks to your wonderful milkweed review, I knew to pounce on Astier de Villatte Eau Chic when I saw it on ebay – one of my all-time top ten unsniffed buys. My only complaint is that I’ve not yet had an opportunity to compare it with milkweed flowers. Perhaps the wonderful AG Eau du Sud should also be counted in the non-traditional cologne category. Noz: thank you SO much for reminding me of the sensational Astier de Villatte colognes..I went through 100 ml bottles of each. I need to replace them! So happy your blind buy was successful. Wish I could send you some milkweed…mine are about 1 foot tall already. Their scent is fabulous. Chanel eau de cologne is my favorite.. I like ’em spicy: Florida Water (hate the plastic bottles) and several brands of bay rum. It’s been a long workday. Kevin, lordy, lordy, I sat down and LMAO over your edits. Apsara…glad you liked it…hope you have a better day tomorrow! Thanks for the very funny review. Adding clarity by removing, refreshing! Favourite EdC’s are 4711, Eau Dynamisante, Eau du Sud and Malle’s Vetiver Extraordinaire (if that counts as an EdC). Hamamelis: ah…wore the Clarins back in the day…that nice red bottle. Yes, that one, and AnnS here discoverered that ED is very similar to Eau du Sud. Eau de Sud lasts a lot longer on my skin though. Mugler Cologne!! The best cologne ever! As a more obscure one, I like Ellena’s Eau de Lalique, with it’s weird note of dill that doesn’t smell at all like pickles. I’ll second the Florida Water, but I make my own from the old recipes, the new plastic version doesn’t suit me. Masha: haven’t tried Eau de Lalique…love dill. The Chanel Exclusifs ‘Eau de Cologne’ is marvelous……when I need a summer time refresh, then I often reach for Eau Dynamisante of Clarins. guerlainguy: two votes for the Clarins. I used to take that on vacations to hot places…all you need is to douse your face in cold water and spray on some E.D. to feel better (and cooler). I love eaux de cologne. Favorite is Eau de Guerlain. Nicolai makes some good examples, l’eau Chic being one to try. james: true…Nicolai has many good cologne options…Vie de Chateau for one. I think I’ll pass. Honestly, it is almost insulting to sell this for such a high price when one could go to the Body Shop and get “white musk” for substantially less money. Most of my favourite cologne-y type fragrances are of vintage formulation- Annick Goutal’s Hadrien, Cristalle, O de Lancolme and O de Lancolme Intense. I will also chime in with 4711 but I haven’t actually smelled it in about forty years…it was prevalent in my home of origin (wonder if it has also been reformulated?) I also adored Calyx in the summer (before it was re-formulated it was a mouth puckering citrus extravaganza) but I am not sure that would qualify it for this genre. Current likes that are available- Ineke’s Derring-Do and Jo Malone Grapefruit, for it reminds me a bit of Hadrien and eau de Sud combined. For cheap thrills- Pacifica’s Brazilian Mango Grapefruit, Tuscan Blood Orange, Neroli Orange Blossom and Sandalwood (which has a hefty dose of citrus). Due to the low prices of these I can spray quite liberally during the intense summer days. chocomarzipan: excellent choices…I enjoy the California Star Jasmine from Pacifica too…Malibu Lemon Blossom. yes to both of those as well! (I actually still have a bottle of the Malibu Lemon Blossom from when it first came out). I’m late but wanted to respond, as I’ve tried this scent twice now and been thoroughly unimpressed. I wouln’t mind if it was a good-smelling, populist cologne, but it doesn’t even smell nice to me. I love the Chanel cologne and Hermes Eau de Narcisse Bleu, but if Eau de Sauvage qualifies, I think that’s my absolute favourite. Annikky: you’re welcome. I’ve been trying to think of another fragrance besides Jardins d’Ecrivains George that has white musk that I LIKE..and you just reminded me: Hermes Gentiane Blanche (I’d say it’s the “freshest” “cleanest” thing I own, white musk wise). Eau de Sauvage certainly qualifies. My favorite colognes are Andy Tauer’s Cologne Magreb and Chanel’s Eau de Cologne. Filomena: well, Chanel made a good showing in this poll. Cologne Magreb IS nice! Oh, I forgot about Cologne du Maghreb – that one is so lovely and has so much personality, it barely feels like a cologne. I’m not a fan of citrus scents and cologne in general, but when I feel in the mood for a light and refreshing neroli, Le Couvent des Minimes will do. This scent is pretty amazing. Somewhat similar to Neroli Portofino, but I like Malle’s variation a little more. One of my favorites for the summer, even though I have 40+ (mostly niche) bottles.